One milkshake, please. Hold the cotton candy, slice of pie and unicorn poop. OK, I have had just about enough of this Freakshake nonsense. I thought the rainbow food craze was bad enough. Stop rolling your eyes at me. I know I wasn’t the only one who wanted to hurl at the thought of actually ingesting a rainbow bagel. The rainbow bagel was a monstrosity and now we have traded one crazy, sprinkle covered pipe dream for another. 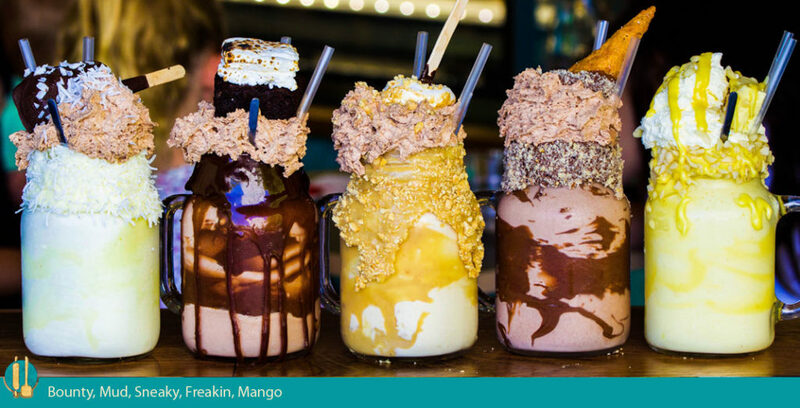 This manic obsession with OTT food has got to stop, and I for one think it needs to start with these monster milkshakes. For those of you who haven’t had access to the internet for the past couple of months, a Freakshake is a milkshake on steroids. Also known as crazy shake and monster shakes they take a regular milkshake, quadruple it, pour it into a vase and top it with an Everest of whipped cream, candy and baked goods. The whole concept originally hails from a little Australian café called Patissez where they wanted to ‘take the humble milkshake & make it into something special’. Now, at Patissez, they made a point of each milkshake having it’s own theme. It wasn’t about ‘buying a myriad of sweets & shoving it in to the top of a mason jar’. I have to say I applauded that. It was indulgence, but controlled indulgence. Sensibly Instagrammable, if you will. Then massive milkshake fever then swept the world and the next place it popped up was Black Tap in New York which, in my opinion, is where things really spiralled out of control. Suddenly people were lining up for an hour to get their hands on this behemoth of ice-cream and cake. Yes, fine. These milkshakes are very, very impressive to look at. I could feel my double-tap happy thumbs twitching just by their mere presence on my laptop screen. Let’s put the Instagrammability aside for a second ok? Let’s take a moment to acknowledge that these things are ridiculous overflowing sugar explosions that leave you with 1600 calories and a $15 check at the end of your straw. I don’t care what anyone tells me. Nobody, and I mean NOBODY needs a milkshake that’s been topped with a candy bracelet, popping and gummy candy and not one but TWO massive rainbow lollipops. Y’hear that? That’s the sound of your dentist crying with joy because you have personally funded his 10 storey bungalow in the Carribean. And the clincher? They don’t actually taste that great. Those 1600 calories? Best eaten elsewhere. I realize that I’m a bit of a purist so this might not be a popular opinion, but I for one crave a simpler time. A time where your milkshake was simply thick and had a cherry on top. Maybe if you were being wild you would add a candy bar or brownie mix in, but there was nothing crazy. No bells or whistles. No gummy candy. Which brings me to another very sore point when it comes to these frozen blasphemies. I understand the pretzel and Nutella adorned rim. If I tilt my head, I can almost understand the three cupcakes you decided to throw on just for sh**s and giggles. 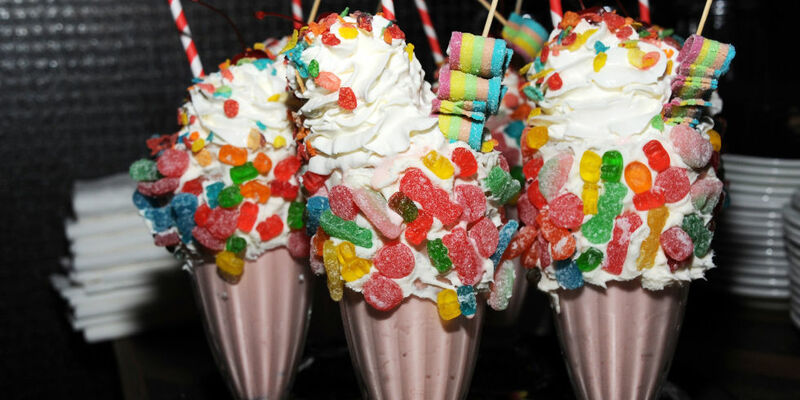 But why on EARTH would you decorate a milkshake with gummy candy? What kind of God awful, sugar-overloaded, textural disaster are you aiming for here? Look, I get it. You’re a wonderful human being and you’re just trying to get #instafamous while helping your dentist put his daughter through Harvard. Well stop it. Go Instagram a pizza, set up a GoFundMe for lil’ miss almost freshman and STOP flocking to this damn yard already.